Loyalty as we know it may be dead. Now that may not be a very positive way to begin an article, but with the Generation Z shopper, it just may be true. Dubbed Centennials by many, this next generation of shopper is expected to reshape retail as we know it. They are people born in 1996 or later, and they are about to take over. And they will be loyal if you adapt to their needs. It is no wonder that this group has a short attention span. They have been raised to express everything in code and 140 character bursts. Lengthy posts and brand messaging will bore them to death. While these teens are like their predecessors in many ways, the biggest difference is in the tools they have access to and use. They can jump from one app to the next — from pics to posts — from conversation to shopping with ease. In fact, many of these shoppers gravitate towards retailers that provide a seamless shopping experience like their lives. With a life that is lived "socially" these shoppers prefer the "we" and not the "me." They seek multiple opinions before making a buying decision and share their purchases online like trophies in a case. This group understands that they are teens (young). But, they believe that they are armed with more power (and intelligence) then their older siblings and parents before them. In other words, they believe that they can achieve the same things at 19 that their parents didn't until they were 29. Which means they expect you to treat them like they are 30 and not 20. Customer experience is everything to this generation. This person is an eye-level shopper. So make sure your best stuff is at their natural gazing line. They have a high value on touch and feel. They value signage if it is to aid the purchase decision. For example, explain the differences between the types of wood in a flooring store. This is seen as valuable. However, other types of signs may not be. But keep the signs at eye level and not above your merchandise on the walls by the ceiling. The one sign they value the most, though, is the price tag. They get very frustrated by retailers who hide the tags or put the prices on the back of merchandise. For example, it's a common practice in camera stores to not price the goods on the shelf. The thought is "get the customer to fall in love and they will pay whatever the price." Not for this generation. They have trained themselves to not even consider an item if it is not within the budget. While they will spend more than their budget at times, this overspend is usually driven by feature set and not brand. There is more of an emphasis on price for this generation than the Millennials. So the last comments about price tags make sense. Make sure your store design shows value through your merchandising. It is not about everything being on sale, but they do want to see that your store is balanced and value is a core value of your store. They enjoy color and "pop" and shy away from sparse and "white space." Stores that have minimal merchandise in a sterile environment are not appealing to this group. But at the same time, they do not like cluttered racks and narrow aisles either. Clutter and "busy" add tension to the sales consideration process. And that's important when you consider how differently this group shops from its older brothers. There is a definite time difference in the shopping behavior of a Centennial versus a Millennial. The Millennial usually went from shop to buy rather quickly. There was not a long consideration period. They did their homework and research before they bought, but it was more of an individual quest. Centennials, on the other hand, spend a lot more time in the consideration phase. They enjoy the hunt. They create Pinterest pages and scrapbooks as part of the shopping process. They consult their community and gather opinions before buying. All of these things add time to the process. They will not be pressured. But could this pressure make them disloyal? The stores that attract Gen Z shoppers have a "vibe" about them. They are "sensory" in multiple ways. For example, your store should appeal to as many senses as possible. Sight, sound, touch and smell are important no matter what products you are selling. They love music. It signifies life. A silent store (or store that plays the local radio station with all its commercials) is considered dead or closing to this shopper. Touch is a big sense for this shopper. They want to be able to interact with the products in your store. They want to try the faucet in your hardware store not just look at it. They want to experience the dimmer of a light. And even smell is important. For years, Abercrombie & Fitch has placed their branded fragrance in diffusers at the front entrance. Even before the person enters the store, the brand expectations are being set. Earlier, I shared that they value community. Recently, Amazon got a patent for a technology that would block shoppers from being able to shop online from within its retail stores if the customer is using their free wifi. The idea is to stop showrooming, which is the practice of using the brick and mortar retail store as a showroom where you can touch and feel the products before you buy, but then go online to make your actual purchase. It is a very common practice which is why Amazon patented technology to stop it. However, the flaw with this idea is that you are telling a generation that values community and friends' opinions that they cannot get that in the store. I have had several retailers tell me they would never put in free wifi for this very reason. But they fail to realize that the Gen Z shopper will show loyalty to the store that embraces the way they live and shop. And that loyalty is evidenced in their purchases. One of the key challenges was the seamless aspect of this generation's lifestyle. Truly, the best environment for this shopper would be if they could go from Instagram post to purchase in store with a click. Small retailers who struggle with omni-channel presence are scared of this idea. However, take heart. Fully 65-70 percent of these group prefers to shop in a store. So the truth is they want to go from post to store location where they can try it on. SEO of your website that makes brands and styles easy to access is important. This last one may seem odd, but with this generation, there is tremendous pride in what they purchase. And a consistent part of the descriptor when they tell is the store where they got it. Think of ways to encourage your customers to "show and tell" from your store. For example, in my shoes stores, we had a sign on the counter that said "Tweet about your experience in the store today and receive 10 percent off your next purchase." It was amazing the number of customers who gladly posted to get the 10 percent coupon. Keep in mind, we asked them to focus on the experience. It was not a check in or "like." And the best part is that we got to see the evidence of the post. So, it was not about the promise of doing it — it was about the rewarding of it being done. And since it was on the customers social network, it was WAY more valuable than anything we could have tweeted on our own. Retailers need to shift from talking about themselves and start talking about their customers. So much of today's marketing and advertising is focused on what the retailer thinks is important versus what the customer thinks. They need to stop selling products and start selling experiences. They need to inspire ideas and projects that connect to the lives of the customer in new ways. Generation Z is showing retailers that they need to revolutionize their stores and experiences or die. 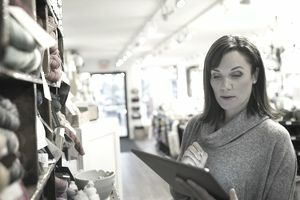 Retailers have to reconsider their old ways of doing business and embrace the new shopper that is coming in their store. This means that all parts of the company have to think as one versus operating in their "silos." This is actually an advantage for the small business owner since he or she is usually all of these departments in one. The beautiful part of this generation is that they do not expect perfection. In fact, they would embrace you including them in your design or development process. They love stores who test ideas and ask for input. Never wait to perfect your idea. Try it out and invite them into the conversation. They will reward you for it. And the reward is their loyalty.